There are sometimes comedy shows I actually like. Though few and far between, they often have some kind of smart humour mixed with some kind of stupid humour. 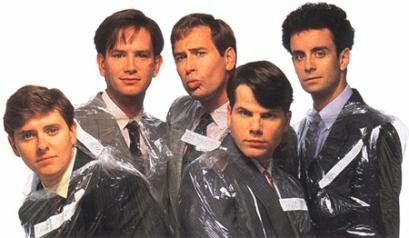 Kids in the Hall was one of those type shows. It established many of the tropes I use when I write comedy these days like the awkward reveal, the dumbass character, the stupid jokes...well, it probably didn't invent those, but I first saw them on this show. Starring in the show were: tough guy Bruce McCulloch, meek guy Kevin McDonald, tall guy Mark McKinney, lead guy Dave Foley, and fruity guy Scott Thompson. I loved them all and it's really hard to pick a favourite. After the show ran they made a movie Brain Candy...which kind of sucked. Then they did a few new shows, which I've never seen. I'm always waiting for the day when they return to their sketch comedy routes in the vein of the original show. I don't think it'll happen. But I'll hold out.